Whether it’s rain, a 1,000-year flood, a hurricane, the threat of snow, or just freezing temperatures, there are always days – sometimes weeks – when our little ones are stuck inside. Those days are the longest, aren’t they? It turns out even 2-year-olds can get tired of television, and it’s anyone’s guess as to whether the kids or parents will have the first meltdown. Fortunately, there are a few indoor activities you can put together in a jiffy to make the day more fun. Here are a few of my family’s favorites. If you have a toddler in the house, chances are you have several (or in my case, too many) containers of snack puffs in the kitchen, your car, the diaper bag … maybe under the couch (no, just me?). Gather them all up and use them to play games, like bowling (pictured below – with my big kid, aka husband – taking a turn). You can also replicate a popular carnival game by stacking them on top of each other to form a pyramid and having your little one toss a beanbag or soft ball at it to try knocking it down. Let’s deal with the most obvious issue first. “Chenille craft stems” are what we called “pipe cleaners” when I was a kid. I have no idea why or when we made the switch. I guess at some point it became frowned upon to craft with a tobacco-related product? But, I digress. Craft stems can be used to make a myriad of crafts – from flowers to little animals – but they can also be used for learning. Kids can practice sorting the stems by color. You can randomly cut a handful of stems and have your kiddo line them up shortest to tallest. You can even use craft stems to practice letters and numbers (though some characters are admittedly more difficult to form out of craft stems than others). I like to have my toddler practice his fine motor skills using craft stems and a colander, asking him to poke the stems through the holes of the strainer. Sometimes we get really wacky and put both ends of the stems through holes to make a crisscrossed mess of colors. If you’re anything like me, you have half-used stashes of craft supplies cluttering up a corner in your house somewhere. Grab all your misfit craft supplies together, and some paper lunch bags or plastic snack bags. Randomly put a handful of craft supplies in each bag. Give your kids some paper and adhesive. Then, have them grab a bag and create a picture using only the supplies in their stash. Ah, the excitement of opening a new box of crayons … only to have them start breaking a few days later. Instead of throwing out the broken pieces, save them in a baggie or container for a rainy day (literally). Have kiddos take unpeeled broken crayons and arrange them in muffin tins or – even better, I think – in silicon molds (we happen to have heart-shaped ones to make Valentine’s Day treats). (Note: You may have to chop the broken crayons into smaller pieces, depending upon how big your broken bits are.) Bake the crayons in a 150 to 200 degree oven for about 20 minutes, until the wax is just melted. After the wax has completely cooled, kids have newly shaped multi-color crayons! I never mind when my toddler asks me to play with him and his playdough. I do, however, sometimes lack creativity in making 3D playdough creations (I mean, how many playdough ice cream cones can YOU make before getting completely bored?). When I have expired my repertoire of playdough foods and animals, we make 2D playdough art. 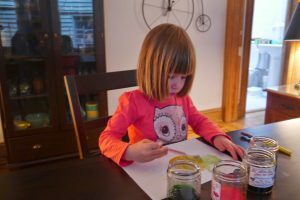 You can do this by rolling out several cans of playdough onto a tray (it’s a great time to use up the old playdough and not be afraid to mix the colors!). This becomes the “canvas.” Kids can then use cookie cutters to lightly stamp shapes and the ends of paintbrushes to draw pictures on the dough. Once they’re done, you can flip over the playdough to create another blank canvas. These activities have helped us survive cabin fever several times. 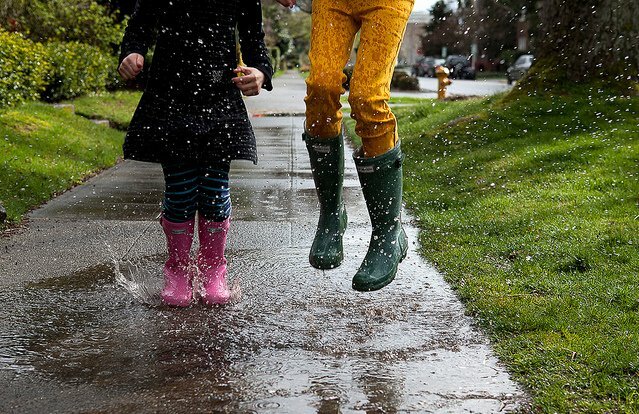 The only problem is they’re so fun, your kids might not want to go back outside once the weather clears!